History: (Wha...Huh?/9) - An elementary-school aged Peter Parker easily dodged in a game of dodgeball due to the usage of his spider-like agility until his teacher, Miss Crabtree, yelled at him for cheating at dodgeball. 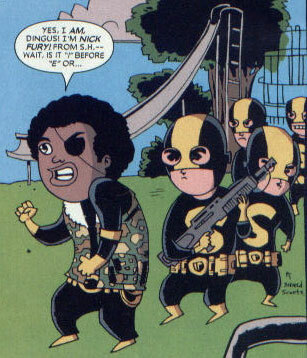 In another part of the playground, the group of children known as the Ultimates argued with Nick Fury, claiming that he was not the boss of them. Comments: Created by Ed Brubaker and Jim Mahfood. A teacher at Peter Parker's elementary school, Miss Crabtree angrily scolded Peter for cheating at dodgeball. S.H.I.E.L.D. was a group of costumed children led by a student named Nick Fury. At the playground, Nick claimed to be the boss of another group of children called the Ultimates. In the process of trying to prove he was their boss, Nick Fury was unable to correctly spell the word "shield." Harry Osborn was a child who went to the same elementary school as Peter Parker. He participated in the game of dodgeball, where he hurled dodgeballs towards Peter. Peter Parker was a child with abilities similar to a spider, including superhuman agility. Before being reminded that with great power came great responsibility, young Peter used his spiderlike abilities to cheat at dodgeball. 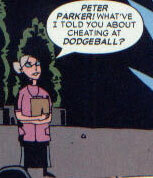 Gwen Stacy was also a student at Peter Parker's elementary school who participated in the dodgeball game. 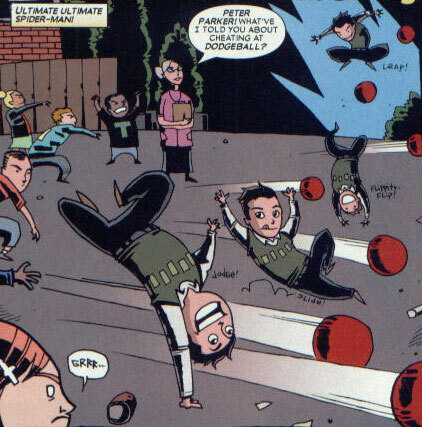 "Flash" Thompson was a student at Peter Parker's elementary school, where he tossed dodgeballs at Peter during a dodgeball game. The Ultimates were a group of children who rebelled against Nick Fury's group of kids. 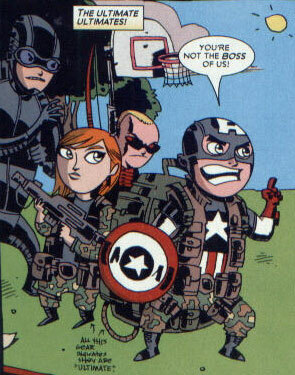 Led by Captain America, the Ultimates consisted of Giant-Man, Black Widow, and Hawkeye. Mary Jane Watson was a student at Peter Parker's elementary school and was angry that Peter cheated at dodgeball.